Snow dogs… & dogs at the snow! The ski season is coming to a close now, but that doesn’t mean the fun is over—now may be the perfect time to take your dogs on a new adventure! 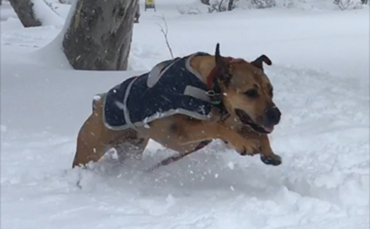 Melbournians are lucky to have so many snowfields within an easy drive for family fun but we are told the best location for a dog friendly visit is about a 5 ½ hour drive at Dinner Plain. You do need to get a permit and there are only certain areas that you can visit – more information is available at http://www.visitdinnerplain.com.au/dogs-in-dinner-plain/. There is also pet-friendly accommodation available in the area so you can make the most of your time in the snow. 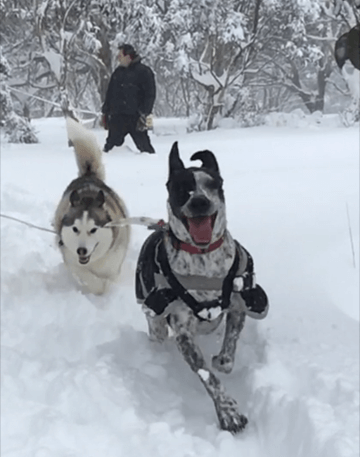 Bec, one of our lovely Dogdayz dog-carers, took her three dogs to the snow for the weekend not so long ago – and they clearly loved it! Bec says “one ‘tip’ I had heard (to protect their paws) was to put Vaseline on before you go out“. You can also pick up booties from most pet stores for sensitive paws that haven’t been in such cold temperatures before. If taking your own dogs isn’t an option you can always visit the sled dogs at Mt Baw Baw, Mt Hotham, Dinner Plains…learn about their fascinating history and enjoy a scenic and exhilarating trip across the snowfields.